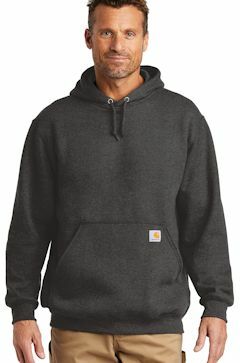 Custom Embroidered Carhartt Thermal lined heavy duty work sweatshirts. Carhartt, Cornerstone and Dickies Brands. Custom embroidery included. A great option on those cold work days where you need protection on the job site. 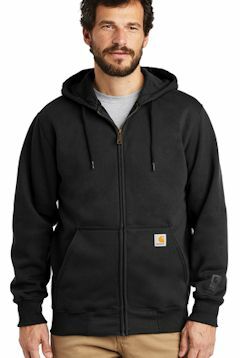 You can count on an embroidered thermal lined sweatshirt, full zip made by Carhartt, Dickies and Cornerstone to have what it takes! Contact us today to order your embroidered thermal lined sweatshirt for yourself or for your entire company! CornerStone ® - Heavyweight Full-Zip Hooded Sweatshirt with Thermal Lining. CS620, 12 oz. 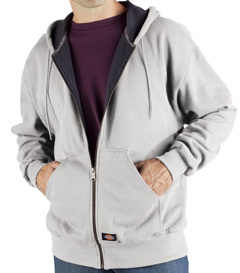 This durable hooded sweatshirt keeps you warm and comfortable in all types of weather. 12-ounce, 60/40 cotton/poly. 9-ounce, 100% polyester thermal lining for extra warmth. Rib knit cuffs and waistband. Brass zipper. Drawcord with brass eyelets. Front hand warmer pockets. Port PocketT for easy embroidery access. Custom embroidered with your logo. 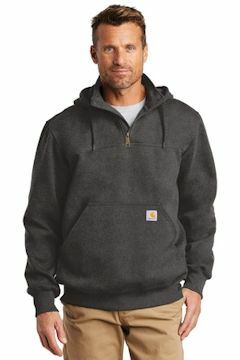 Custom embroidered TW382 Dickies Thermal-Lined Fleece Jacket. 80% cotton, 20% polyester knit fleece; Thermal -lined fleece hooded jacket; Dark inside thermal knit lining; Center front metal zipper; Hand-warmer pockets Custom embroidered with your logo. 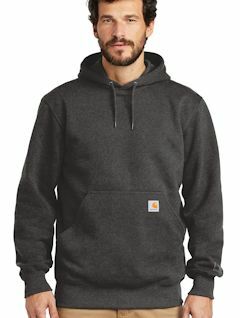 A heavyweight version of the classic hooded sweatshirt, this heavy-duty hoodie stands up to outdoor work in a substantial, water-repellent cotton blend. 13-ounce, 75/25 cotton/poly blend with Rain Defender durable water-repellent finish. 55/45 cotton/poly blend (Carbon Heather). 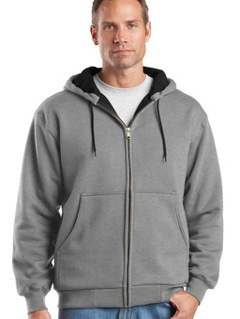 Attached jersey-lined three-piece hood with drawcord closure. Front hand warmer pocket with hidden security pocket inside. Stretchable, spandex-reinforced, rib knit cuffs and waistband. Carhartt label sewn on hand warmer pocket. Original fit. Custom Embroidery Included! 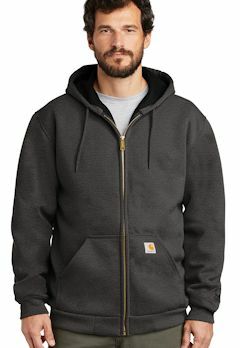 For those days when a heavy jacket is just too much to wear on the job, this durable, water-repellent sweatshirt is the solution. 13-ounce, 75/25 cotton/poly blend with Rain Defender durable water-repellent finish. 55/45 cotton/poly blend (Carbon Heather). 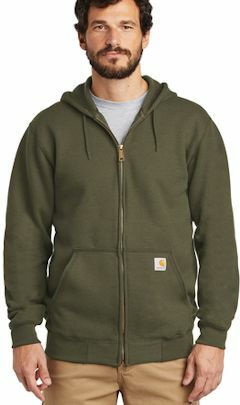 Attached jersey-lined three-piece hood with drawcord closure. Antique-finish brass front zipper. Two Front hand warmer pocket with hidden security pocket inside. Stretchable, spandex-reinforced, rib knit cuffs and waistband. Carhartt label sewn on hand warmer pocket. Original fit. Custom Embroidery Included! This rain-blocking hoodie is work-ready. It helps you stay warm and dry and makes water bead up and roll off with ease. 12-ounce, 50/50 cotton/poly blend with Rain Defender durable water-repellent finish. 53/47 cotton/poly blend (Carbon Heather). 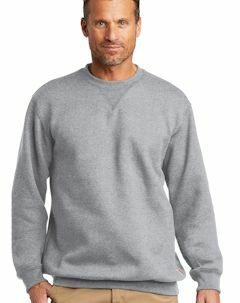 100% polyester thermal lining retains warmth. Attached thermal-lined three-piece hood with drawcord closure. Full-length brass front zipper. Two front hand warmer pockets. Stretchable, spandex-reinforced, rib knit cuffs and waistband. Inside pocket with zipper closure. Locker loop. Carhartt label sewn on left hand warmer pocket. Original fit. Custom Embroidery Included!